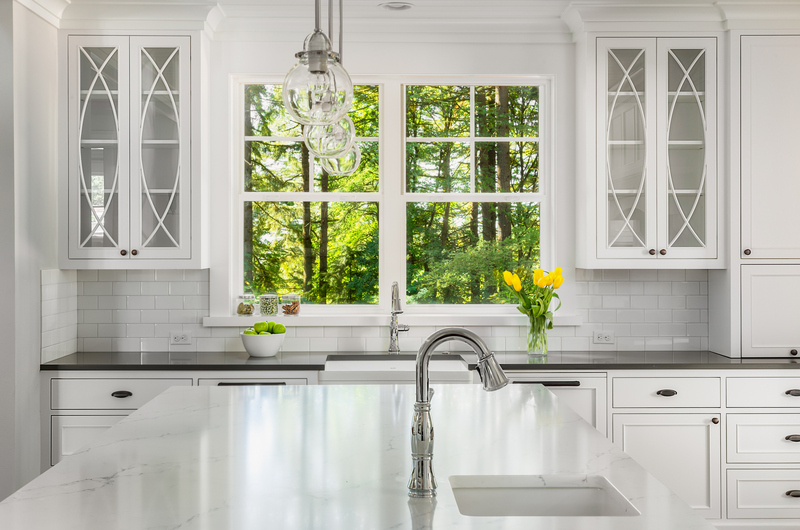 How to Make Your Kitchen Design Your Own - GNH Lumber Co. How to Make Your Kitchen Design Your Own - GNH Lumber Co.
Once you’ve decided where all the cabinets and appliances are going to go in your brand new kitchen, you can start putting your stamp on the kitchen design and truly make it your own. How your kitchen fits into the vernacular of your home is where this style story begins. 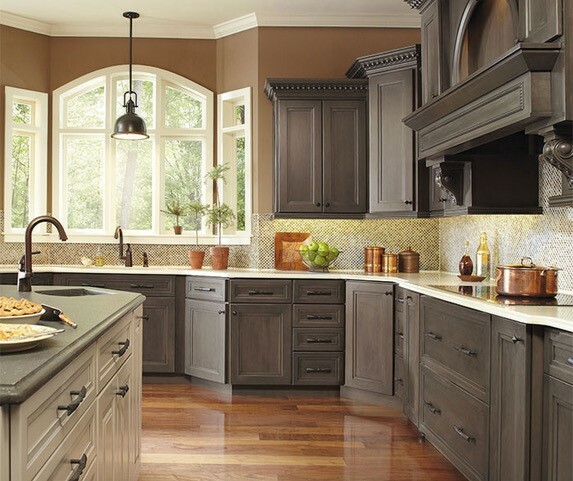 The architecture of the cabinetry sets the stage for modern, traditional or rustic design. Then you can start to make it your own with the selection of surfaces, appliances, fixtures, integrated appliances, color and pattern that make the room work for how you cook, entertain and live. Tile is durable, easy-to-clean, and an art form all its own. You can create your own designs or stick to some pre-manufactured choices. Tiles can add texture, color and artistic flare to your kitchen floor, counter or back-splash. From the subtle textures and tones of travertine, to the bold color of glass tile, you are only limited by your imagination. There are many options of tile today. Incorporated travertine contains subtle intricacies, metal and glass imparts a gleaming shine, and plain white subway tile laid in a chevron pattern behind the stove creates clean, classic look. Make custom tile mosaic designs within a border or a colorful inset behind your stove area. Alternating patterned accent tiles with solids is a simple solution. You might even add a feature wall of stacked stone or exposed brick tiles for an industrial design element! Countertops define how you use the space. For many people the kitchen is the hub of activity in the home. It wears many hats: food preparation, casual dining, homework, and just hanging out. If everybody gravitates toward the kitchen in your home, make it work for you with counterside seating and surfaces that enable you to easily perform the tasks required for both conversation and cooking. It is important to consider the role your kitchen plays in your lifestyle when you are establishing work zones and counter spaces. If you are a baker, your needs will be totally different from the needs of a novice. Marble is essential to a baker, but you would not want it everywhere. You might just want it on your island. 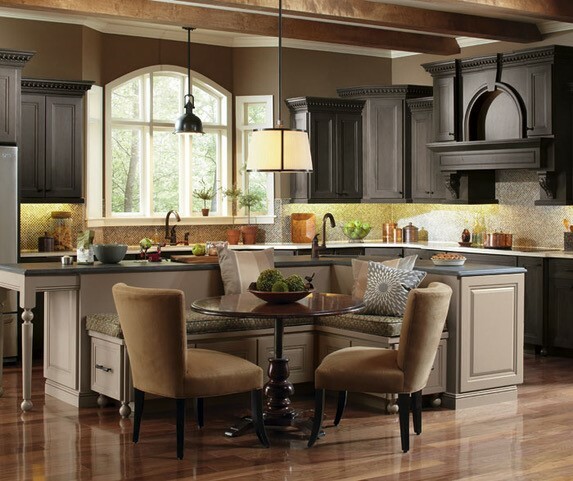 Dark countertops with light cabinetry and light countertops with dark cabinetry mix very well in the same environment, it does not all have to match. 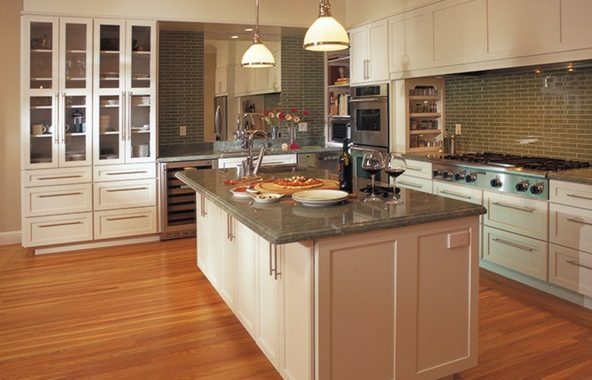 Islands have become the big multi-taskers of the kitchen and can provide a lot of added functionality and personality. Incorporated seating, concealed cutting surfaces and custom storage areas are just the start. Islands can be enclosed with solid cabinets or open for seating. They can even be created from antique sideboards topped with marble to provide loads of vintage charm. Make it your own with materials like shiplap, architectural salvage, distressed paint or even wrought iron. Ranges & Appliances perform a very important function but they should never be short on style. They have become an integral part of the kitchen aesthetic, and changing tastes dictate changing surfaces. The standard stainless steel range has given way to colored enamel, and dark charcoal tones. Appliances can be concealed behind cabinetry or stand on their own as part of your color story. You can also make a design statement with a custom range hood. Color leaves its mark wherever it goes. Even if your cabinetry and walls are neutral to coordinate with the rest of your home, you can still pull color into your kitchen design with tile backsplashes, plants and accessories. Your dishes can provide color when viewed through glass front doors, open shelving and vertical plate racks. Hanging large colorful platters as wall decor can make a bold design statement that provides form and function. Incorporating a large verdigris painted cast iron fireback behind your stove can be quite the conversation starter. Pattern on your floor is a great way to pull in some unexpected design elements as well. If you are at ground zero, put some thought into designing with these surfaces. Create a pattern by laying planks in a chevron pattern instead of straight with the grain. There are wood inlaid edge options to give the effect of a border running around the entire perimeter or just the island area. Lay tile squares on the diagonal and incorporate some random darker pieces throughout for variety. With either wood or tile, you could border off an area and create a rug effect on the floor by laying the inside tile in a contrasting tone on a diagonal or in a chevron pattern. Making a kitchen design your own requires some forethought to find the right avenue for your style to make a mark. It should blend effortlessly with the rest of your home, yet retain its own personality. Antiques, modern art, unique pendant lighting or even modern accessories can all conspire to tell the story that is uniquely yours in the kitchen. 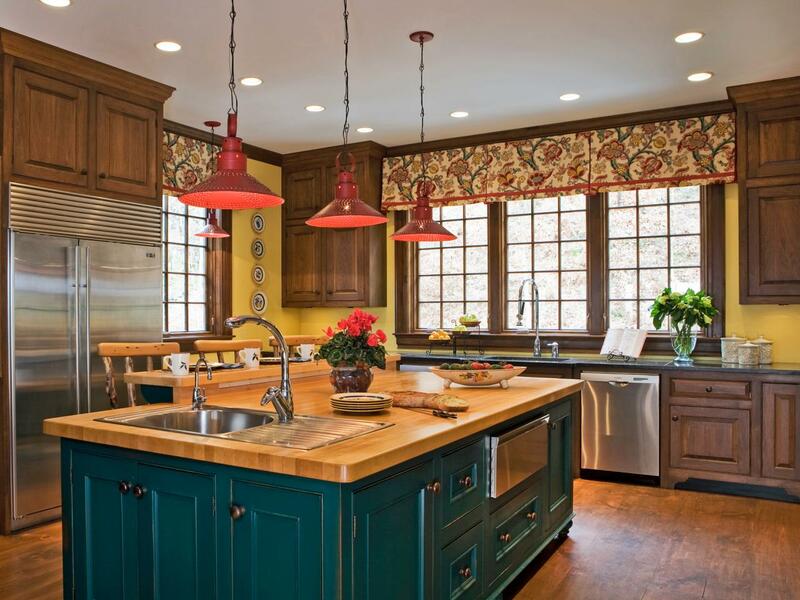 For more tips and advice on your kitchen redesign, ask the experts at GNH Lumber! 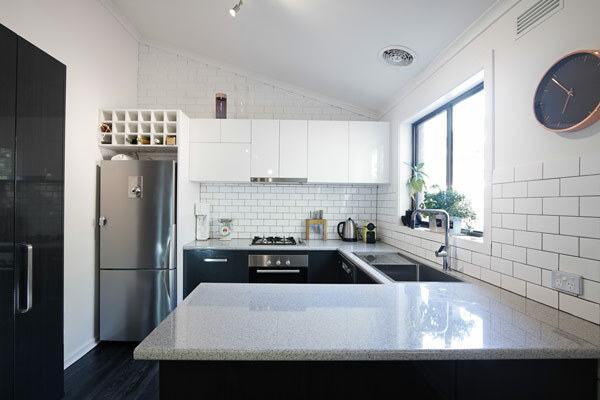 Are you tired of living with your old kitchen? Why wait! Stop by your local GNH to learn more and to get that project started today.